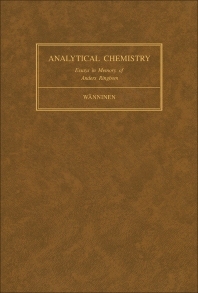 Essays on Analytical Chemistry: In Memory of Professor Anders Ringbom is a collection of analytical chemistry papers and research studies in honor of the memory of Professor Anders Ringbom, a highly esteemed researcher and teacher. The papers are grouped under the following headings: Chemical Equilibria, Titrations, Photometric Analysis, Electrochemistry, Separations, Trace Analysis, Kinetic Analysis, and Other Analytical Topics. This book is organized into eight parts encompassing 52 chapters. The first part deals with the concept of chemical equilibria in acid-base and metal complexes. The next parts cover the applications of different titration techniques, photometric analysis, electrochemistry, and separation techniques. Other parts highlight the principles and application of trace analysis, including the determination of heavy metals and airborne particulates. The last parts contain papers that examine the analytical application of the rate phenomena of several chemical reactions. These parts also tackle the topics of sampling, statistical analysis in analytical chemistry, and the features of photoelectron spectroscopy and capillary electrophoresis. This book will be of great value to analytical chemists, researchers, and analytical chemistry students. "Acid-Base Reactions in Nonaqueous Solvents"
"Measurement of Hydrogen Ion Concentration"
"Acid-Base Equilibria of DipeptidesII. Effect of Hydrolysis"
"The Determination of Proton Binding Sites by NMR-Titrations"
"Applications of Some Ligands Containing Pyridyl Residues"
"Determination of Stability Constants of Metal Complexes"
"On the Selectivity and Analytical Importance of the Formation of Mixed Ligand Complexes"
"Spectrophotometric Study of Mixed Copper Complexes with Bis-(carboxymethyl)dithiocarbamate and Ligands containing Nitrogen Donor Atoms"
"Stability Constant Values for the Protonation and Copper(H) Complex Formation of N,N-Di(2-hydroxyethyl)-l,3-Propanediamine in Aqueous Solution"
"Analysis of Multicomponent Equilibria with Potentiostatic Methods"
"The Formation and Stability of Mixed-Ligand Complexes"
"Use of Spectropolarimetry for Studies of Complex Equilibria"
"Multidentate Ligand Substitution Reactions as Applied to Analytical Chemistry"
"Metal-Ion Complex Formation in Solution and the Soft-Hard Principle of Chemical Interaction"
"On the Association of Water in Some Simple Electrolytes"
"The Structures of Hydrated Divalent Transition-Metal Ions in Solution"
"Graphical Method for Construction of Titration Curves"
"Application of the Ringbom ECR (Exactly Correct Reference solution) Principle to Titrations"
"The Precision of Photometric and Potentiometric Measurements and Titrations, Particularly Gran Titrations"
"Photometric Complex-Titrations of Submicromole Amounts of Metals"
"Newer Trends in Redox Titrimetry"
"Investigations in Analytical Photometry. Long-Path Photometry"
"Colour Changes of Ion-Combination Indicators"
"Effects of Auxiliary Complex-Forming Agents on the Colour Change of Metallochromic Indicator"
"Investigation of Chemical Reactions: Examples of Polarographic Approaches"
"Lipophilic Complexing Agents Designed for Use in Ion Selective Liquid Membrane Electrodes"
"The Use of Chelate Compounds in Inorganic Analysis by Gas Liquid Chromatography"
"Complexing Agents in Ion Exchange Chromatography"
"Ion-Pair Extraction in the Analysis of Drugs and Related Compounds"
"Di(p-butylphenyl)thiocarbazone, A New Metal Chelating Extractant"
"Activation Analysis of High Purity Substances"
"Determination of Cu, Pb, Cd, Zn in Sea Water and Plankton by Anodic Stripping Voltammetry"
"Separations Rapides de Traces Métalliques en Solution sur Gouttes de Mercure"
"Direct Atomic Absorption Spectrometric Analysis of Solid Samples"
"Sample Atomization in Low Pressure Flames"
"Chemical Methods for Analysis of Airborne Particulates"
"Analytical Application of the Rate Phenomena of the Reaction of Metal Chelates"
"The Analysis of a Paper on Analytical Chemistry"
"Photoelectron Spectroscopy in Analytical Chemistry"
"Statistical Analysis in Analytical Chemistry"
"The Development of Analytical Techniques"
"Capillary Electrophoretic Method Based on Potentiometric Detection"